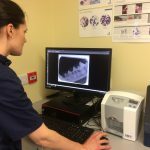 We have a special interest in pet dentistry, and we are proud to be the ONLY clinic in County Clare with dental radiography equipment. 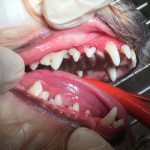 This means that we are able to properly diagnose and treat your pet’s teeth, and we give your pet the same dental care you would expect for yourself. Our ultimate aim is to preserve all of your dog and cat’s teeth throughout their entire life. Sadly this is becoming less and less likely, and dental disease is so common now that it is being regarded as ‘normal’ by pet owners. Studies indicate that 70% of cats and 80% of dogs over 2 years of age have signs of dental disease, and we certainly see this in practice. 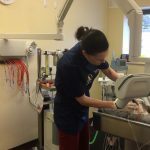 We see this affecting pet quality of life on a daily basis, and our aim is to help you manage this and to ensure your pet leads a long life, free of any dental pain. 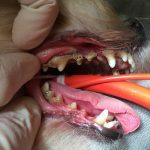 What is dental disease and how does it affect my pet? Dental disease is caused by the accumulation of plaque, a soft and sticky deposit that is continually forming on your pets’ teeth. If plaque is not removed daily then it begins to harden into a substance called tartar. Tartar builds up under the gum line as well as below it. If you notice that your cat or dog has yellow teeth, we recommend that you bring your pet to us for a dental health check as this early visible symptom could lead to more severe and painful dental conditions. Even in mild cases, your pets’ breath may become foul smelling and the mouth can be a dangerous source of infection affecting your pet’s health. Professional treatment consists of taking a complete set of dental radiographs under general anaesthesia to identify any disease under the gum line. This enables us to correctly treat and manage any underlying dental disease. We then perform a dental cleaning using our dental ultrasonic scaler and polisher. 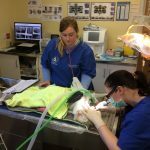 We understand that dental treatment under anaesthesia can be a frightening prospect for both you and your pet. We adhere to the highest standards of practice to ensure that your pet is safe in our care while undergoing this necessary procedure. We frequently hear from pet owners that their pet is ‘like a new animal’ after professional dental treatment. This is because animals do not readily show pain like humans do and they will endure ongoing chronic discomfort in their mouth without it affecting their appetite or behaviour. Prevention is always better from care. We include dental care advice as part of every consultation we do, and our nurses run free of charge dental clinics to help you find the best home care solution for you and your pet to ensure great dental health.